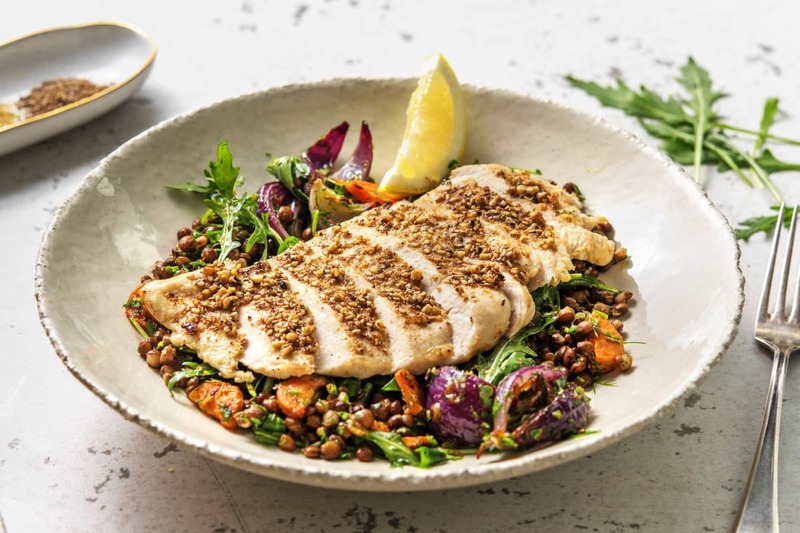 We love a good Chicken with Lentil Salad and Carrot and this deliciously simple, chef-curated recipe doesn't disappoint. Time to bust out the pots and pans! Preheat your oven to 200°C. Trim the carrot, then halve lengthways (no need to peel). Chop widthways into 2cm pieces. Halve, peel and chop the red onion into wedges. Pop both onto a baking tray. Sprinkle over the cumin seeds, some salt, pepper and a little oil. Toss well to evenly coat the veggies in the oil then pop onto the top shelf of the oven and roast until the veggies are tender and slightly coloured, 25-30 mins. In the meantime, roughly chop the dill and coriander (stalks and all). Zest, then cut the lemon into wedges. Drain and rinse the lentils in a sieve. 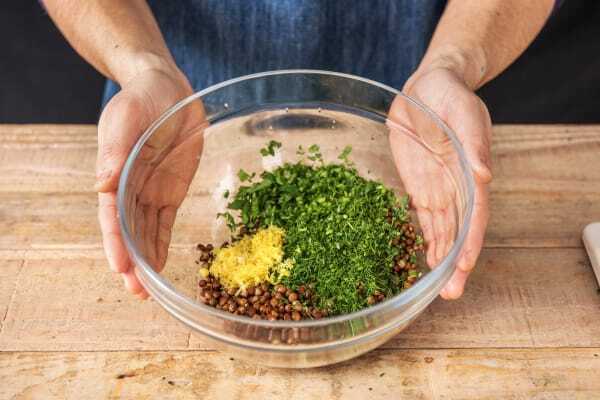 Pop the herbs, lentils and lemon zest into a mixing bowl and season with salt and pepper. 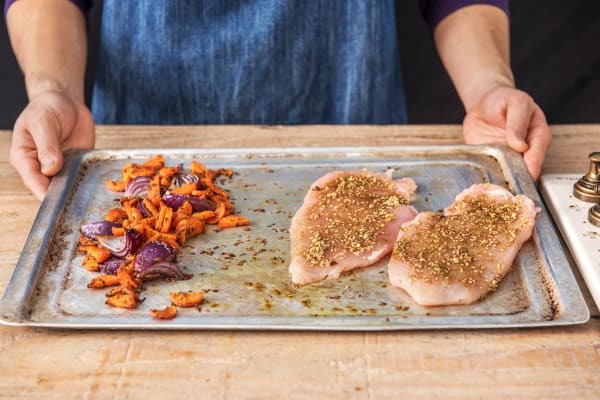 Lay a chicken breast on a chopping board and cover with a piece of clingfilm. Use a rolling pin or the base of a saucepan to bash it until 1cm thick all over. Repeat for the other breasts. Pop the dukkah in a small bowl and mix with a small splash of olive oil (we suggest 1 tsp of oil per person). Spread the dukkah over the top of each chicken breast. iIMPORTANT: Remember to wash your hands and equipment after handling raw meat! When the veggies have 10-12 minutes left, give the tray a shake and move the veggies to one side of the tray. Pop the chicken breast fillets onto on the other side and return to the top shelf of the oven. Cook until the chicken is cooked through, 10-12 mins . iIMPORTANT: The chicken is cooked when it is no longer pink in the middle. 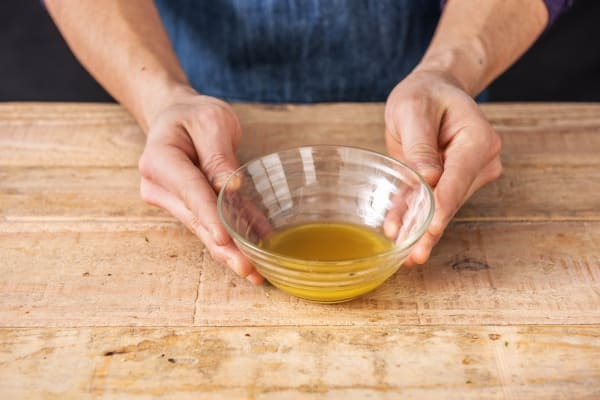 While the chicken is cooking, put the honey mustard into another small bowl. 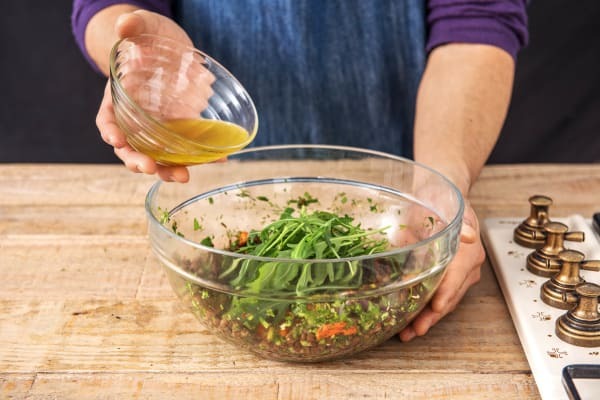 Squeeze in the juice from two lemon wedges and add the olive oil (see ingredients for amount), to make the dressing. Whisk together with a fork and add a small splash of water to loosen the dressing. Season with salt and pepper. 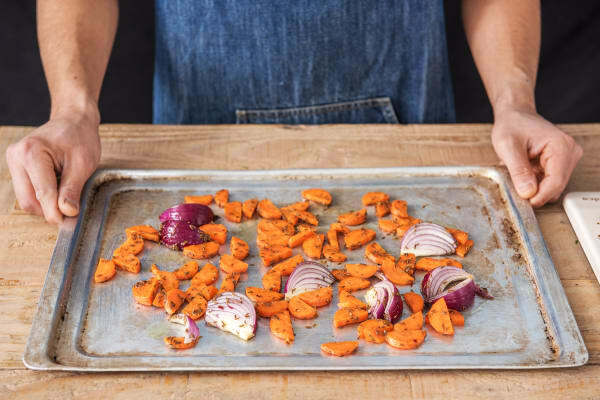 Once the veggies and chicken are cooked remove the tray from the oven and mix the roasted carrot and onion in with the lentils, along with any cooking juices left on the tray. Pour over the dressing and add the rocket to the bowl. Gently fold all the ingredients together then share onto plates. Thickly slice the chicken then pop on top of the lentils and serve with any spare lemon wedges. Enjoy!